This entry was posted on October 7, 2018 at 1:30 pm and is filed under Bike stuff, Casual snark, Computers, Cooking. You can follow any responses to this entry through the RSS 2.0 feed. You can leave a response, or trackback from your own site. You really need to peddle a few bikes. Having too many choices will make you goofy. It’s kinda like trying to buy salad dressing. PS: I’ll trade you a Traynor AM50T acoustic amp and a Shure microphone for Bloo Wazoo. I do love ’em. 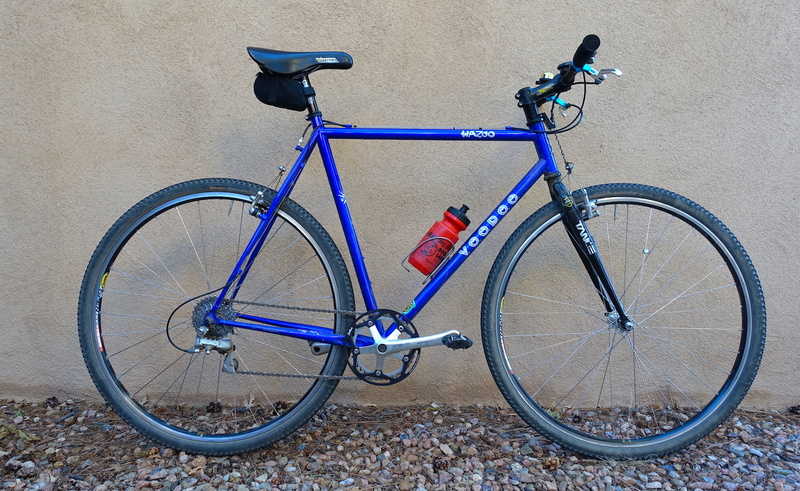 I had planned to ride a Steelman Eurocross but the Voodoo was easier to unhook, so there you have it. I’m actually fresh out of review bikes now that I’ve wrapped the Jones project, and I kinda hope it stays that way for a while. I need a break from simmering other people’s notions in a rank broth of my own biases. No deal on the amp and mic, sorry. I like that Voodoo. Now and then I think about broadening the drivetrain, and then I think again. The First Noble Truth and all. Gee, you busted my bubble. I already saw myself on the Wazoo going up Ramsey Canton road. After all, Elwood traded a Cadillac for a microphone. And, in keeping with the First Noble Truth, I was trying to spare you some stress, like when you run out of bike hooks and Herself finds out. Aw, the frame is probably too big for me anyway. Ah, the age of stuff to plug in on your kitchen countertop. My mother was big into these gizmos as is my mother-in-law. I scratch my head when she insists my wife get an electric skillet out instead of using the perfectly good, fancy 4-burner stove in their kitchen or drags out an electric knife sharpener or can opener to do something so simple..
As to “salad dressing”.what’s to choose? 2-3 parts extra-virgin olive oil to 1 part vinegar (balsamic or otherwise) freshly ground pepper and way more salt than you think you need comes out perfectly every time. For some reason most ‘Muricans screw this up, with way-too-much vinegar and not nearly enough salt. I always hated salad dressing. Ptui, ptui, ptui. Ate dry salad for most of my life … until I discovered olive oil. A drizzle of that, with some salt and pepper, and I’m good. This ‘ere egg machinery has too many parts for me. A skillet and a spatula suit my inner minimalist. Plus they force you to focus on the task at hand. No texting/social media while cooking! 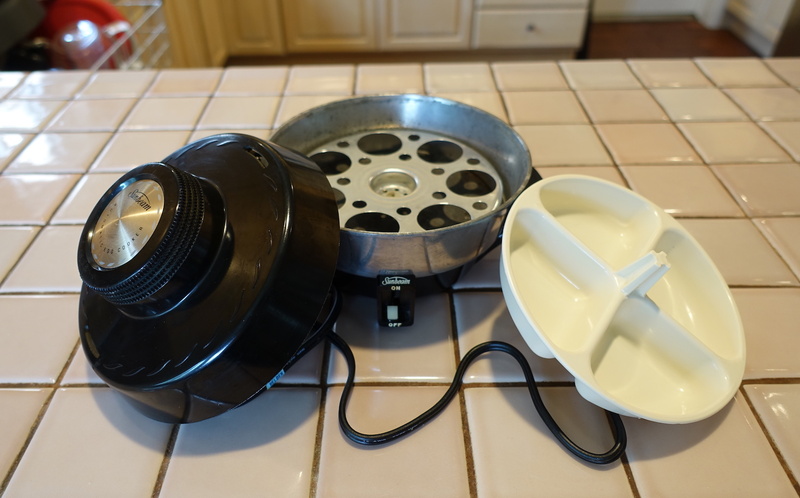 What does your Sawtooth Power Mac have in common with the Sunbeam egg cooker? Marc Newson designed products for both companies. See, now, this is why I keep blogging. I learn stuff. Dude’s done bicycles, too. “The future isn’t futuristic anymore,” says Newson. Truer words, etc. Thanks, Estaban and Patrick. I’m loving that Montblanc fountain pen he designed. Interesting comments, I’m a 3 to1 vinegar to olive oil freak. Electric egg cooker or electric can opener, very hard to decide which is more worthless. Oldness messes with the mind! We got one of the Keurig single cup coffee makers for Christmas last year. Now the whole family drinks tea, and if I want a decent cup of cheap coffee; I go to McDonalds for a senior cup. There is still a Melita single cup drip filter holder in the cupboard but no filters or fresh coffee. We acquired a Keurig back in Bibleburg because Herself the Elder liked ’em. We eventually shifted it to the House Back East® for Airbnb guests who felt likewise. I myself thought its output was what one might expect from the bladder of Beelzebub. But then I’m the kind of weirdo who keeps two coffee makers and an espresso maker in the kitchen, just in case the primary machine goes all pear-shaped. I also have an old campfire coffeepot and a filter basket that will work on a travel mug or a Thermos, but that’s for camping and/or the Apocalypse. I just hope Ms. Ginsburg stays around for at least 3 more years.